To begin making the Vellai Dosa Recipe (Sweet Jaggery Dosa Recipe), in a large bowl, dissolve the powdered jaggery along with 1/2 cup water and allow it to rest for 30 minutes. After 30 minutes, strain the jaggery water to remove impurities. Add the wheat flour to the strained jaggery mixture and stir continuously until there are no lumps. Add remaining 2 cups water and mix to make a smooth Vella Dosa Batter. Toss in the cardamom powder and mix well. The next step is to cook the Vella Dosa on a skillet. Heat a skillet on medium heat and pour a ladleful of batter on the skillet. Swirl the pan in a circular motion to spread the batter around to make a thin crepe like dosa. Drizzle 1/4 teaspoon of ghee around the vella dosa and cook on low heat until well done. Flip over to cook the other side for a few seconds and serve warm. Serve the Vella Dosa as it is for a quick energy boost for breakfast, as a snack or for festivals. Vella Dosai was a Navratri special dish at 36, Ansari Street, home to my grandparents. My grandmother was fondly called Manni. Her iconic tiffin is the Vella Dosai. Puja began as early at 6 am during Navratri. Manni used to hand out the Vella Dosai to us as our morning tiffin. Any rice based items were served to us only after the pooja which went on till about 12 noon. She swirled out the batter on an iron griddle, patiently slow roasted the Vella Dosa at just about medium heat and the batter caramelised to form a light and soft dosai. 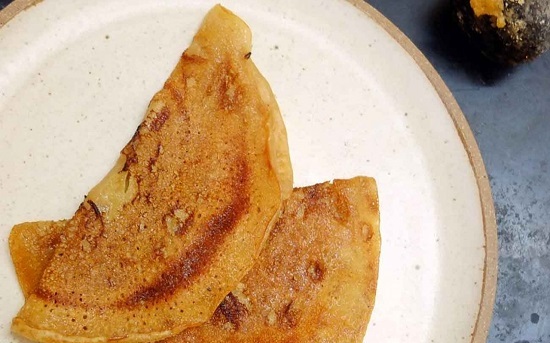 The secret of the Vella Dosai is the resultant magic of Manni�s touch and the chemistry between wheat and jaggery!